Storm Racer G 42" Deluxe Driving Machine from Sega takes arcade racing to a new level with a super fast driving experience like no other! Storm Racer will have players coming back again and again to master the 12 cars and 14 tracks available in the game. Storm Racer G features 6 exciting tracks for players to compete in including 6 hidden tracks that can be unlocked. Players have a choice of racing in 7 different cars, with an additional 7 cars that can also be unlocked. Up to 8 machines can be linked together to assist multiplayer mode, or 8 players can compete individually in single player mode. Players of all skill levels can enjoy this high octane racer with the choice between manual and automatic transmission as well as beginner and expert levels. 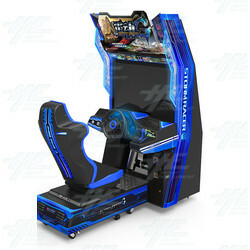 Furthermore, this classic arcade style racing game is jammed packed full of features including full force feedback steering wheel, a built in camera so players can see who they are racing, vibration speaker under each seat, 42" LCD screen, 720p HD resolution with 60 frames per second for high speed gameplay and a 4.1 sound system. All these features combined make Storm Racer G a high quality classic style driving machine that will draw players of all ages and skill levels time and again! Storm Racer G 42" Deluxe Driving Machine from Sega takes arcade racing to a new level with a super fast driving experience like no other! Storm Racer will have players coming back again and again to master the 12 cars and 14 tracks available in the game. Storm Racer G features 6 exciting tracks for players to compete in including 6 hidden tracks that can be unlocked. Players have a choice of racing in 7 different cars, with an additional 7 cars that can also be unlocked. Up to 8 machines can be linked together to assist multiplayer mode, or 8 players can compete individually in single player mode. Players of all skill levels can enjoy this high octane racer with the choice between manual and automatic transmission as well as beginner and expert levels. Furthermore, this classic arcade style racing game is jammed packed full of features including full force feedback steering wheel, a built in camera so players can see who they are racing, vibration speaker under each seat, 42" LCD screen, 720p HD resolution with 60 frames per second for high speed gameplay and a 4.1 sound system. All these features combined make Storm Racer G a high quality classic style driving machine that will draw players of all ages and skill levels time and again!